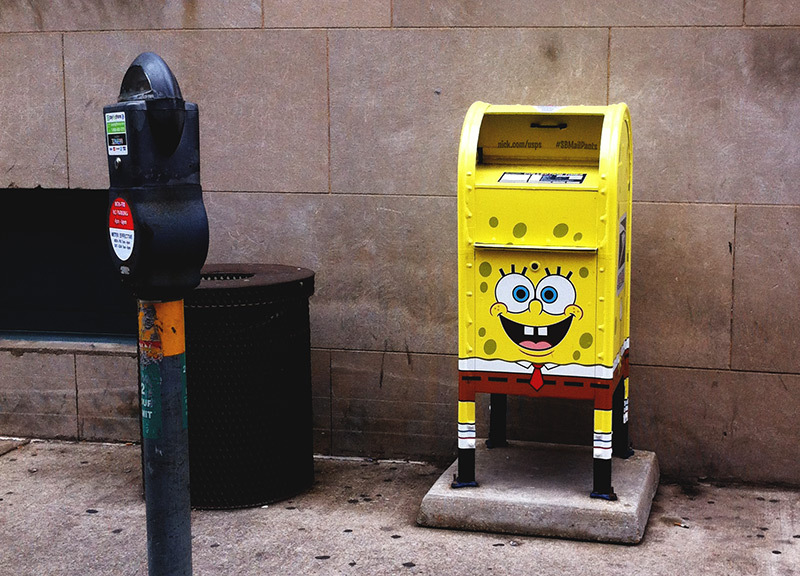 Why Is There A Spongebob Squarepants Mailbox Downtown? Because The USPS's Future Depends On It. It's no secret the U.S. Postal Service is kind of struggling these days. Hell, the fact that the service posted a $1.9 billion loss in the second quarter of this year alone should make that evident enough. Then there's the fact that the USPS is willing to ship just about anything you slap a stamp on these days, even seemingly used condoms or items explicitly prohibited in its own rulebook. These days, it seems hipsters and credit card companies are the only ones still paying the USPS to send letters across the country — and only the former are still handwriting theirs. With its latest campaign, though, the USPS is trying to change all that. 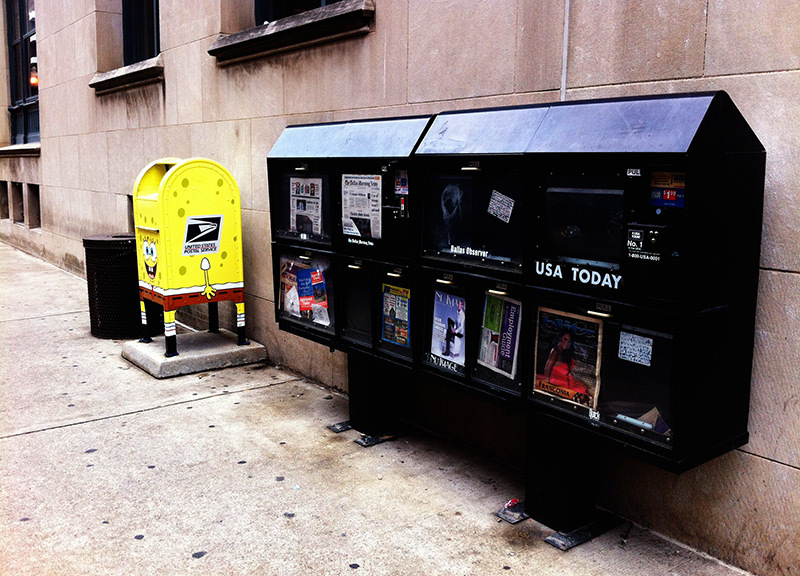 In partnership with Nickelodeon, the USPS added wraps to some 30 mailboxes in Atlanta; Boston; Charlotte, N.C.; Chicago; Dallas; Hollywood and Orlando, Fla.; Kirkwood, Mo. ; Los Angeles; Miami; New York; Philadelphia; and Washington to make them look like the network's Spongebob Squarepants character. Ostensibly, the move is one designed to encourage children to write letters — probably to Santa, given the promotion's original timing — and otherwise familiarize themselves with the postal system. To that end, Nickelodeon also posted some animated videos teaching kids how to “write the perfect letter” on its site, and the USPS initially offered up free Spongebob postcards that they'd, in turn, mail postage-free. And although the boxes were supposed to disappear January 5, the three North Texas spongeboxes have managed to hang around an additional seven months thus far. One of those sits outside the Dallas County Tax Office at 500 Elm Street, with another located at Lewisville's Vista Ridge Mall and a third at Plano's Polo Towne Crossing shopping center. Sure, it might be a bit hard to believe that a handful of mailboxes painted to look like a character whose popularity peaked in 2004 and placed in such kid-friendly locales as the city's tax office will help resurrect such a troubled entity, but stranger things have happened. Like a show about the unlikey pairing of a giant pink starfish palling around with a species he normally eats gaining such widespread popularity in the first place.